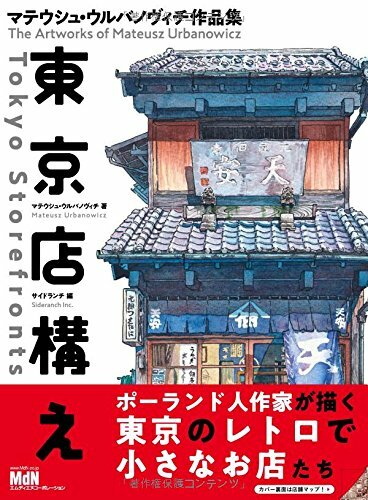 Tokyo Storefronts by Mateusz Urbanowicz is one of my favourite artbooks of 2018. The Japanese title is 東京店構え マテウシュ・ウルバノヴィチ作品集. Mateusz Urbanowicz is an artist from Poland who's currently working in Japan for an animation studio. He also does freelance work and draws his own comics. When he has time, he makes Youtube videos too. Tokyo Storefronts features a collection of beautiful watercolour artworks of shopfront of Tokyo shops. The shops are from short apartment blocks or houses, not those inside shopping malls. There's something really charming about Japanese shops, just how neat they are, and the design of their architecture. The first few drawings started out as a personal art project in March 2016. Then it grew into a larger project and now we have a 160-page book featuring 50 shops. There's a good variety of shops to see and some cutaway drawings of interiors are also included. Addresses of the shops are also provided, and there's also a hard-drawn map showing there they are in Tokyo. The drawings are detailed and the colours and light are wonderful. There's this pastel look and feel that reminds me of the background art of Japanese animation. The captions provided talk about things that are interesting to Urbanowicz, the things that caught his attention and made him want to draw the shops. At the back of the book, he talks about the tools he uses and his drawing process from start to finish. The text is written in Japanese and English. This guy is talented and hardworking, so this book is really inspiring. This is a book I will come back to often. Most highly recommended. I found out that Amazon account is not interchangeable with other countries, so you may have to sign up for a new account with Amazon Japan in order to buy the book. Amazon Japan's website is in Japanese but there's a link someone on the page (at the bottom) that allows you to translate the Japanese text into English. The order and check out process is similar to other Amazon branches. Just received it. Really beautiful and interesting. The map is a great add-on.